Meet behind the community centre building. There is a public car park that you can access via Hanover Way. We'll meet in the car park prior to the Rabble session. Hi! Day-to-day I am a Physical Activity, Health and Wellbeing Coordinator for schools in Windsor. 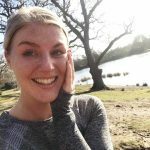 I have recently designed two new programmes for schools, one based solely on mental health which is delivered as part of a new curriculum, and the other (which we have named ActiveMe) teaches children about food and nutiriton, and health and wellbeing through fun, physical activities and games. I think Rabble is an awesome way to bring fun back into physical activity, especially for us adults that don't always get enjoyment of being active, and maybe see it as a chore! Rabble increases your fitness whilst having loads of fun! If it's been a while since you've engaged with physical activity, or just want to try something new and meet likeminded people, then Rabble is definitely something you should give a go!